We will now be offering all courses with an option to split them so you come and take part of it one week and then return the following week to complete the course. It may not be the best name to give the course but it does allow you to rest more during a course and also to do longer courses if required. It is also sometimes difficult to work out exactly how long a course is needed so this way you can do part and then adjust the second week to exactly suit your needs. It is also great if you have something planned for the weekend though we are happy to adjust the days to suit you! We can only see one and that is having to make another journey to us if you were doing residential. This is not actually that bad as you will save a night at the accommodation so that is £35 towards your travelling costs. It might even work out cheaper for you! We do not charge any more for this service so for residential courses it is the normal price of any course less £45 (the one night that you save at the accommodation), so as an example the 40 hour manual course is now £1440 instead of £1485. You can also do just how many hours/days you want to start with (subject to our availability) but as there are so many options it is best to contact us for a price. This now allows us to offer you even longer courses which we would recommend for people who feel they might not pick things up easily and two examples are shown below but we are happy to arrange anything you feel would be better suited for you! 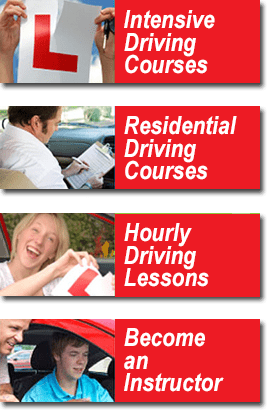 45 hours – 9 days in total Here we would recommend taking 25 hours the first week, then 20 hours with your practical test the following week. Prices starting from £1295 for manual gearbox (£1339 for automatic) with a residential option for some or even all of the duration! 50 hours – 10 days in total Much the same as above but with 25 hours and your test in the second week! Prices start from £1419 for manual gearbox (£1469 for automatic), again residential is available too!